Here's the information I promised regarding the new releases. First, let me show you the new releases from JustRite Stampers. There's LOTS of excitement surrounding this release!! Besides a lot of darling new Borders, Centers & great Kits, they're also introducing a brand new shape to their product line & that is the SQUARES!!! For those not familiar with the JustRite Stampers, they have a very unique concept in their "Design -It Yourself" stamping system. 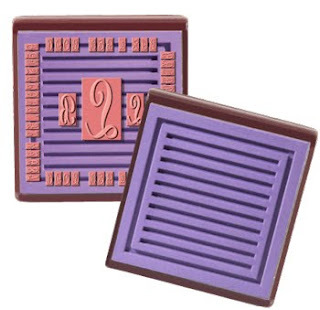 Their wood stampers with their interlocking ribbed grid surface allow you to design your own stamps, choosing from a fabulous selection of interchangeable borders, centers, fonts & now, even frames!! Each stamp securely locks into place in the grid system which ensures amazingly precise stamping!! And because you can mix & match, you then can basically CUSTOM DESIGN your VERY OWN stamps with your own personalized greetings, along with your choice of borders, frames, centers, etc.!! ***Just THINK of the possibilities, especially with the holidays coming up!!! Ohhhh, it's all sooooo exciting, sometimes I can hardly stand it!!!! And because they're all designed to fit into a basic, geometric shape, you can cut out all your shapes using your Cricut cartridges, (maybe with your new Cricut Gypsy!! ), & of course your Spellbinders dies work perfectly, or other manufacturer's dies!! Easy Peasy!!! Ideal for creating custom monograms, card making and scrapbooking! 10 borders - 1 5/8"
10 centers - 1 5/8"
*Center accepts all 1-5/8" Centers Too!! ***The double groove border on the 2" stamper creates tremendous flexibility. 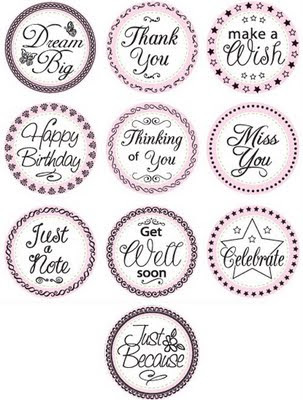 Use 1-5/8" centers & borders & customize the outer ring with the 15 pt font enclosed. Or, make a monogram in the center & spell out a name, address or acustom greeting in 15 pt on either of the outer rings!! 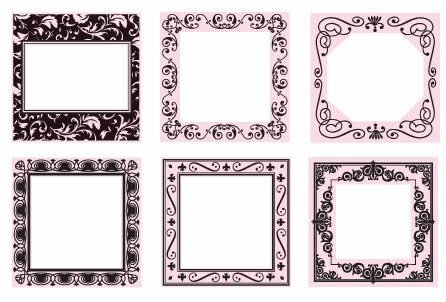 JB-09060: Decorative Frames Borders -SQUARE-2"
JB-08790:Just A Note Centers & Borders- ROUND- 1-5/8"
10 Borders and Centers Included. Can be used with either 1-5/8" or 2" Round Stampers. 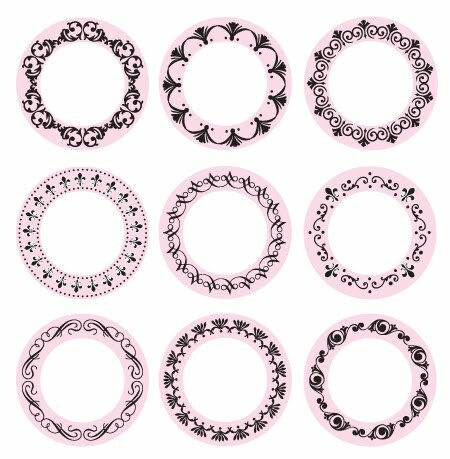 JB-09050: Decorative Frames/Wide Borders- ROUND- 2"
JB-08340: Deluxe Decorative ROUND Monogram Kit- ROUND- 2"
Square 2" Stamper only (stand-alone). Border enables use of 6 or 15pt font to create custom sayings. 2" and 1 5/8" Centers fit in the center area. JB-08330: Curlz Monogram Kit- ROUND- 1-5/8"
OK, sooooo, now that you've seen them, how can you resist them??? The new releases are available right now for pre-order, with all items expected to be shipped to the retailers (that would be me!!) sometime in November, except for the last one in the list, the Special Occasions Monogram Kit (JB-08335), which is scheduled to ship in December. When I spoke to the manufacturer, JustRite Stampers, they said they're expecting a very large volume of orders for these new releases, so, let's get YOUR pre-orders into them ASAP, so we get ourselves stacked up at the front of that line, & we get the earliest shipping possible!! Are you ready?? Then let the pre-ordering begin!!! To place your pre-orders, just email me the list of items that you want, along with your ZIP CODE. Please put the words "JUSTRITE NOV PRE-ORDERS" in your email subject line. My email is: glendascreativeplace@yahoo.com . I will then send you your PayPal invoice!! BTW, if there are other JustRite items (or any of the other products I carry!!) that you also want to order, you can certainly include them all on one order & I will discount your shipping just as if they were all going to ship together (even though the pre-ordered items will ship out separately!!). Also, I just received a little shipment of the highly coveted Tim Holtz new, gorgeous Rock Candy Stickles & instead of selling them outright, I will include a bottle with every pre-order placed for the new JustRite Releases!!! These new Stickles have a clear, glitter-like appearance & are absolutely perfect for your holiday cards and layouts!! One last thing about the JustRite Stampers: Please remember that for those projects you're planning to produce repeatedly, such as holiday cards, or gift sets, there are some great options to help you get it done quickly. First, there are the self-inking mongram stampers (1-5/8" round), that allow for really fast, repetitive stamping. 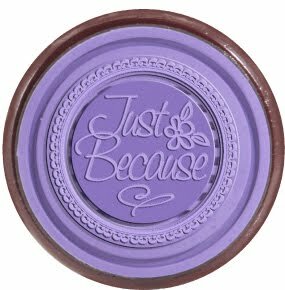 If you're using other sizes (other than the 1-5/8"), you can always order extra wooden stampers in the size you need. This allows you to set up your project on the extra stamper & leave it on there, until you're good & ready to remove it, even if you still need to use other stamps in that size!! That way you'll always have a free & readily available stamper. Since the JustRite sets really lend themselves to the creation of your own customized stamps, once you take the time to design & set up your custom stamp, I don't know about you, but I'd be in no hurry to disassemble it!!! Monogram Self-Inking Stamper Kit 1 5/8"
This self inking kit comes with a 1-color reversible ink pad, 4 borders & centers, Large & Medium Letter Set- Times Roman font- 78 characters! ***Limited Time Offer--Bonus 2-Color Reversible Dry Ink Pad. Glenda's Regular Price: $33.95, but MY Special Sale Price is: $29.95!!! OK, get your lists together & email them over to me ASAP to glendascreativeplace@yahoo.com !! Don't forget to also send me your zip code. I can't WAIT to see what all my incredibly creative customers are going to make with all these new releases!!! Let's get started!! Oh WOWEE!!!! New Releases from JustRite Stamps & Spellbinders both!!! I'm SOOOOOO Excited!!! And as if it couldn't get any better, Spellbinders has also put together some new releases of three new Nestabilities sets, including Nest-08 which includes all 4 sets of the Octagons in it, then there's Nest-09 which has bundled 4 different sets of their most popular Flowers dies, including Blossom 1, Blossom 2, Peony & the gorgeous Dahlia. Last but certainly not least is Nest-10 in which they have compiled 4 of the most popular Labels sets!! I am taking orders for all these new products right now. Some are rumored to be limited, so please, let me know right away if you want any of these. I also just re-stocked all of my holiday sets from JustRite Stamps, after learning that the darling Halloween set, "Witch Way to the Treats" (which was a limited edition!) sold completely out a couple weeks ago & there's no way to re-order any more!!! In all fairness, the manufacturer DID forewarn us that we needed to stock up early on all of the limited edition sets, because once they're gone, they are really gone!! So be sure to let me know right away if you want any of the Christmas or other holiday sets!! 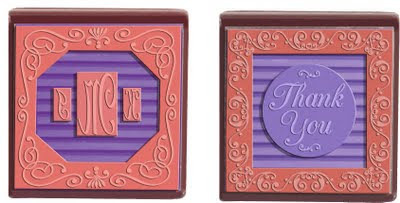 The same applies to the limited edition Spellbinders dies (which include MANY of their beautiful holiday dies!!). Spellbinders has once again sent us an email warning us that we need to stock up now, while they're still available, because there are currently no plans to re-manufacture the limited editions when they're gone!! I will be posting all the photos & my prices ASAP, but in the meantime, you can always glance at my pricing for similar items now to get a good idea of what I'll be charging (and you all KNOW I always try to have great prices for you!!) --and of course, I always freely disclose all my prices, so feel feel to contact me if you need pricing before I manage to get them loaded into my site!! I am soooo stinkin' excited about these new products, I can hardly stand it!! I honestly expected that we'd have to wait until CHA rolled around in January to see any really cute new releases from most of the manufacturers, and then voilà, here came these new releases almost back to back from 2 of the hottest companies out there!!! I just can't WAIT to get my hands on ALL of them, LOL!!! So be sure to let me know about your interest in any of these new products right away and keep a look out here for the photos, details and of course, the prices!! Be sure to email me for any questions at glendascreativeplace@yahoo.com (and try to put "NEW RELEASES" in your email subject line!!). Ohhhhh, these are all SOOOOO cool & soooooo cute, you all are going to absolutely LOVE them!!! This is going to be a whole lot of fun!!! I can't WAIT!!! !